Apple has quietly released a new iPhone OS app that allows users to access the company's online store directly from their favorite iPhone OS devices. The app, simply called Apple Store, includes support for most of the activities that you normally perform on Apple.com, including browsing through products, reading reviews and, of course, placing orders. Notably, Apple Store allows you to pre-order your very own iPhone 4 device without having to visit the company's Website or requiring you to enter any of your AT&T information—presumably, it uses your existing phone's unique identifier to retrieve your account data instead. Finally, the app can be used to find Apple stores anywhere in the world and make reservations for Genius, Personal Shopping, and One to One training appointments. It also appears to support notifications—although it's unclear what these would be used for; it's conceivable that they may remind users of upcoming appointments or order status changes. 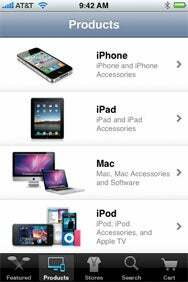 The Apple Store app works on any iPhone OS device (including iPad, where it runs in iPhone compatibility mode) running iPhone OS 3.0 or later and is available for free from the App Store.